Lyme Regis /ˌlaɪmˈriːdʒɪs/ is a town in West Dorset, England, 25 miles (40 km) west of Dorchester and 25 miles (40 km) east of Exeter. It lies at Lyme Bay on the English Channel coast at the Dorset–Devon border. It is nicknamed "The Pearl of Dorset". It is noted for fossils found in cliffs and beaches that are part of the Heritage Coast—known commercially as the Jurassic Coast—a World Heritage Site. 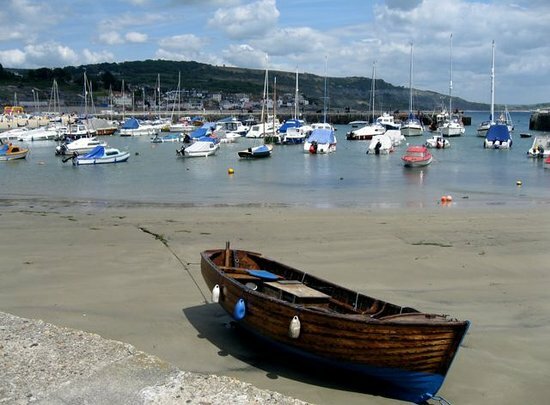 The harbour wall known as "The Cobb" appears in Jane Austen's novel Persuasion, in the John Fowles novel The French Lieutenant's Woman, and in the 1981 film of the same name, which was partly shot in Lyme Regis. Its one-time mayor and MP was Admiral Sir George Somers, who founded the English colonial settlement of the Somers Isles, now known as Bermuda. Lyme Regis is twinned with St George's, Bermuda. In July 2015 Lyme Regis also became "tripled" with Jamestown, Virginia, as the Historic Atlantic Triangle of Lyme, St George's and Jamestown. The 2011 Census gave the parish and electoral ward a population of 3,671.